Chris Blake is a mental health clinician who said he uses science every day when diagnosing people and developing treatment plans. But his reason for marching is much more personal. 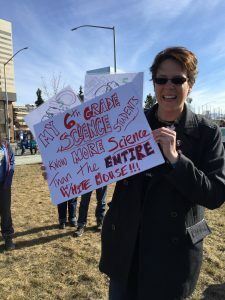 She said she thinks her students are getting mixed messages about science and its validity through social media that are causing them to doubt what they are being taught in school. 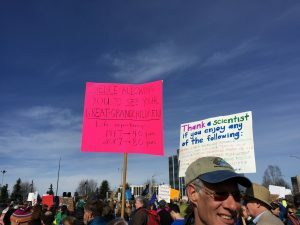 Rebecca Larue and her mom, Sherri, said they attended the march because science is part of everyday life. Without science, “I think we’d still be living in a cave because we wouldn’t have fire or the wheel,” Rebecca said. “Sometimes we think that stuff isn’t science, but it is,” Sherri added. 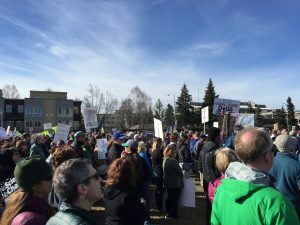 Other marchers talked about the need for science to be the basis for policy making, and the importance of funding scientific research.